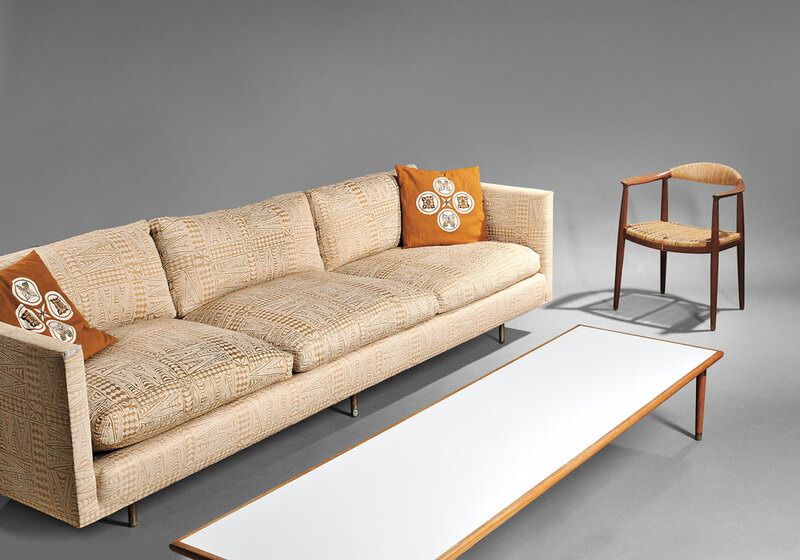 The Burke House | Mid-Century Modern Architecture & Furnishings | Skinner Inc. The Mary Griggs Burke Estate includes the furnishings of the Burke house, on Centre Island in Oyster Bay, New York overlooking Long Island Sound. Designed and furnished by Boston architect Ben Thompson, the home was featured in the book: Design Research: The Store That Brought Modern Living To American Homes. In 1956, the magazine Architectural Record reviewed the home for its architecture and elaborate Japanese-style garden. Mary Griggs Burke was best known for her passionate collecting of Japanese ceramics. To house her collection and find furnishings of good design, she turned to Thompson, who was well known in architectural circles as the founder of The Architects Collaborative (TAC). Over a two-year period (1952-54), Thompson constructed a modern home for Burke that took advantage of the views of Long Island Sound and included carefully chosen and placed furnishings provided by Design Research in Cambridge, Massachusetts. Founded by Ben Thompson, the store became the place to go for modern design during the middle of the century. In his work on the Burke house, Thompson combined his own designs with the Danish modern aesthetic that was so popular at Design Research. This catalog offers a glimpse of the interiors in situ through the photography of Andre Kertesz. Today, the beautiful and mature home has stood the test of time. Skinner is pleased to offer early Design Research furnishings from the Burke house at auction on December 6, 2014 in Boston (Lots 396 – 447). View the catalog online. Murase, Miyeko. Jewel Rivers: Japanese Art from The Burke Collection. Richmond, Virginia: Virginia Museum of Fine Arts, 1994. Thompson, Jane and Alexandra Lange. Design Research: The Store That Brought American Living To Modern Homes. San Francisco, California: Chronicle Books, 2010. Pages 68 and 69, with illustrations of the Burke House. The Architects Collaborative. “Informal Landscaping Keynotes a New House.” Architectural Record. August 1956: pages 154-160. This entry was posted in Blog and tagged architecture, Ben Thompson, boston auction, Design Research, furniture, interior design, Jane Prentiss, Long Island, Mary Griggs Burke, mid-century modern, modern architecture, modern furnishings, New York, Oyster Bay by Jane Prentiss. Bookmark the permalink. 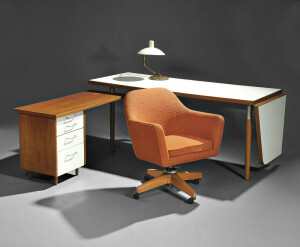 Director, 20th Century Design, Skinner, Inc.